This isn’t my comfrey plant, but I ordered seeds and plants this year. From what I’ve researched, it is a good livestock feed with enough protein to keep animals healthy; I got Bocking 14 cultivars for plants, which are sterile and can be reproduced only by separating the roots and replanting. I also got true comfrey seeds which I sincerely hope grow. I have to make sure I follow the directions on that exactly and be patient. This is for herbal purposes. 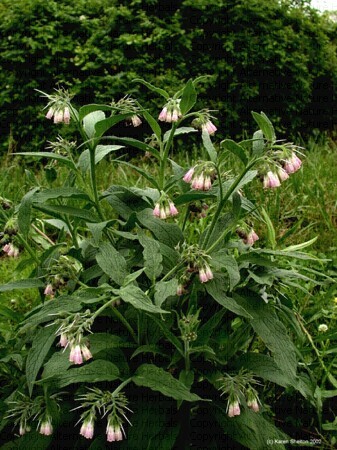 This site tells you all you ever wanted to know about comfrey. I planted eggplant (long purple and white), sweet peppers,Aanaheim chiles, pomodoro tomatoes, and Thai hots earlier this month. As usual, I got zero germination from the Thai hots, but since this is the third year I’ve had the seed and tried, I guess I didn’t expect anything so I’m not really terribly disappointed. I did get heating mats though, so I was hoping my germination would be a little better. As usual, I have to give a salute with my trowel to Seeds from Italy because I had 100% germination with both the eggplant and the tomatoes. Tragedy!! I put the tray outside so they could get the breeze blowing on them and not get leggy — and I had the bunny poop tray in my hands and forgot it was on the step — and I STEPPED ON MY PLANTS!!! I killed at least four eggplants from stepping on them….I’m glad I have more seed and it’s early in the season though! Last year I couldn’t get any germination until rather late in the season, and I didn’t get the harvest I was hoping for with eggplant. I planted peas out front; I planted sugar snap peas in one bed and Tohono O’Odham peas in another. The Odham peas are old so I don’t know how well they’ll germinate; the snap peas are already sprouting I think. Did you know that the first six inches of pea shoots are edible? You can eat them like spinach or lettuce. I can’t wait to try them. I bought borage seed this year too, and hope it does well. I am trying to expand my garden into more perennials and into herbs other than oregano, rosemary, and thyme; I love those and we use them a lot, but I also would like fenugreek, sage (I plant it every year and manage to kill it every year), more lavender, hyssop, calendula, chamomile, dill, and I can’t think of what else now…and I actually bought seeds for all of those. So now, the front yard will be mostly herbs and perennials, and the back yard will be the veggies. Now to get the back yard into shape and situated for rotational gardening! I am so excited! I found a lilac that will grow in my climate! I couldn’t get it this time at the nursery, but I will buy one next payday. I love the smell of lilacs, and they have a bonus in that it is also a dye plant. But not lavender colors; the leaves and flowers give a sagey green, and the bark and twigs give orange. Surprising, huh? I can’t wait to have a tree large enough to play with. I actually want to end up with a living hedge around the front yard, so am playing with different ideas for temporary fences to keep the javelina out of the front yard and out of my plants. The fence would only need to stay until the plants were established and tangled enough to keep them out, however long that might take. I told Mr. Tin Foil I was going to buy bright orange electric fencing tape to keep them out and he wasn’t pleased. It’s still a possibility though…if the county tries to give me a hard time that’s what I’m going with — it’s temporary and they can’t fine me or make me pay a permit fee for a temporary fence. They do make green though. I only said bright orange because I knew he would both believe I would do it out of spite (I would) and to get his goat. I bought more thyme and rosemary at the nursery today; the wacky winter weather we had along with some pretty hard freezes (26 degrees) killed my three year old rosemary bush as well as all my thyme plants; we use entirely too much of those herbs to be without so the purchase was needed. Mr. Tin Foil helped me re-pot them into large pots tonight. It made me so very happy to have my hands in loamy sweet smelling dirt. He keeps telling me I’m a lady, but I think I’m just a peasant farmer at heart. That’s my gardening progress so far; pictures will come when everything’s a little more organized. Thank the Gods school is coming to a close for a while. I need the time for the yard! ← Apparently others at my job are sick, too.